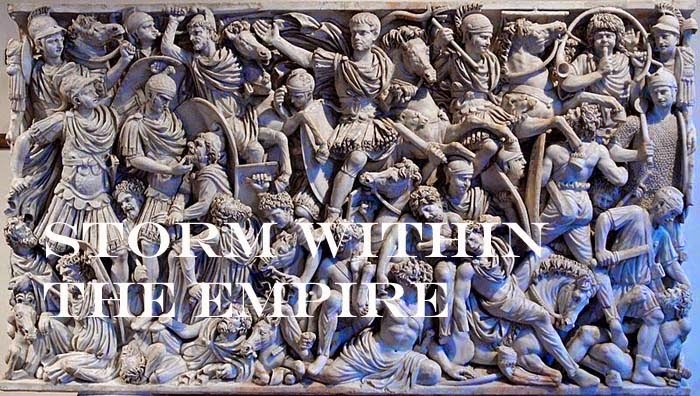 Storm within the Empire: Parthia, all three commands in battle array. Parthia, all three commands in battle array. All three commands are deployed on the parade ground. Each are identical in composition and one could ask, why three commands? Firstly, my Romans (Eastern) are three commands strong, Sassan have five and with the projected mix of Arabo-Aramean, Armenian and Pre-Islamic Arabs, there should be enough for a giant size engagement in the future. Suffice it to say, I enjoy big battles. Each command have their banner in a distinct colour which is used as a colour theme for the elements. Great paint jobs, I love the banners! Some banners do require some research, but for the most part they are speculative representations. They do set the army apart.